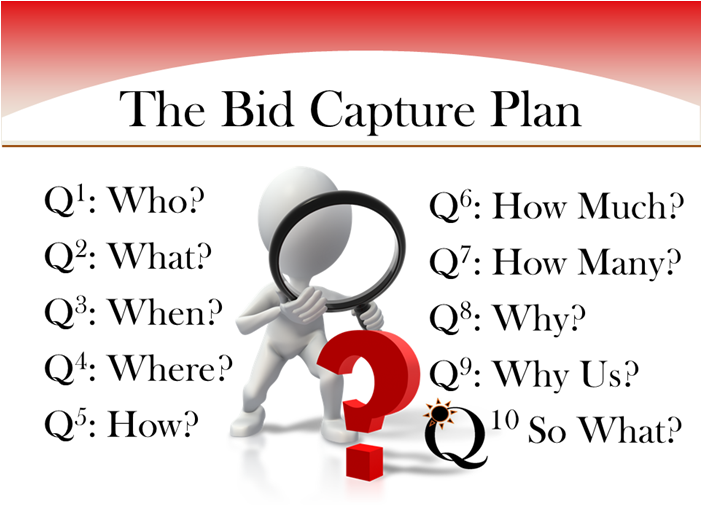 Every bid and proposal effort is an investment: an investment of time, money, and energy. Before you invest in developing a competitive proposal response, you should ensure your business development and program management teams have key information about the customer, the requirement, and the competition. Without insight into customer needs and requirements, you are wasting your resources. Just knowing who your competitors are is not really valuable. You need to know your competitor’s capabilities, strengths and weaknesses, pricing strategies, and your competitors’ view of your competitive position. From information gathered before a solicitation is publicized, Q10 Contracting can lead the proposal team through a collaborative process designed to develop a competitive win strategy that evolves into the proposal’s win themes. Can your proposal development team answer these fundamental questions? Who is the actual customer? What are the problems (stated and implied) that need to be solved? When does the work start? How does the customer…perform or manage the job? perceive our company? How much money does the customer have to fund the requirement? How many people are required to effectively satisfy the requirement? Why does the customer have this problem or want this problem solved? When compared to our competition, why would the customer want our solution? You offer great ideas, great workers, and great experiences: So What? Q10 makes you answer this most important question throughout all sections and all volumes of your proposal. What exactly is the customer going to gain from your solution vice your competitors’ ? How exactly will the customer benefit from your proposed plans or proposed solution?